Gas is expected to be restored Saturday to roughly 550 people in Ottawa's Blackburn Hamlet and Innes Park neighbourhoods, Enbridge says. Dudas said around 5:30 p.m. that there were about 40 homes that had still not been reconnected. 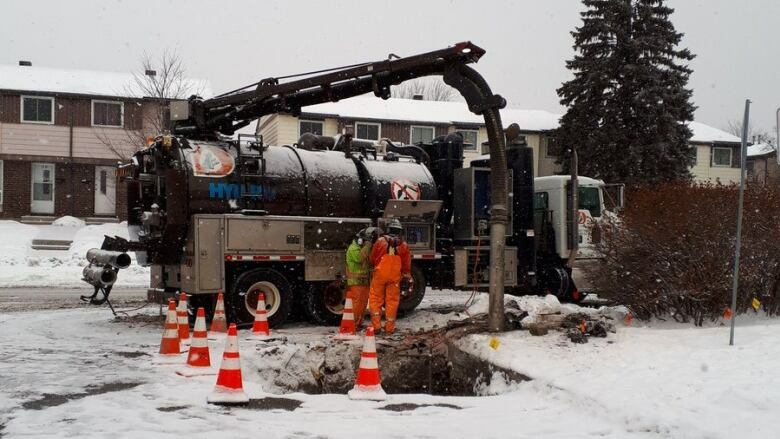 Enbridge has repaired a gas line that was damaged overnight on Thursday, and technicians are going door to door to re-connect customers to their natural gas, a spokesperson for the company told CBC. City workers were making repairs to water service at the same time Enbridge was also working at the site, Innes Coun. Laura Dudas told CBC News, when a contractor hit a gas line. Hundreds of residents had been without heat for most of Friday, Dudas said, and some were also without water. Any <a href="https://twitter.com/BlackburnOttawa?ref_src=twsrc%5Etfw">@BlackburnOttawa</a> residents still without heat this morning and in need of a place to warm up while they wait for <a href="https://twitter.com/enbridgegas?ref_src=twsrc%5Etfw">@enbridgegas</a>, can stop by my Ward Office at the Blackburn Arena starting at 8:30 am. While water has been restored to all residences, some 100 homes are still without gas and around 70 homes near Orient Park Drive and Kelden Crescent are under a precautionary boil water advisory, Dudas said. Affected residents will be contacted by Ottawa Public Health, Dudas said. The water is considered safe for everyone else, she added. In the meantime, Dudas urged residents to check on their neighbours in case they hadn't heard about the warming centre. "Go knock on your neighbours' doors, double-check that they're OK, and make sure that you provide this information to them so that everyone can get to somewhere safe and warm this evening," Dudas said. The affected homes are on Autumn Hill Crescent, Braeburn Place, Falkirk Crescent, Garden Park Lane, Greenway Park, Kelden Crescent, Orient Park Drive, and Rondel Street. Customers can contact Enbridge at 1-877-362-7434.